The Great Monkey War lasted decades. Many lives were lost on both sides, but neither was able to deliver the final blow. Negotiations were impossible. Only one race could survive on this overpopulated planet, or at least, what was left of it. One accident after another left entire continents inhospitable. The world’s large population was forced to condense into the only areas that could sustain life. War was inevitable. 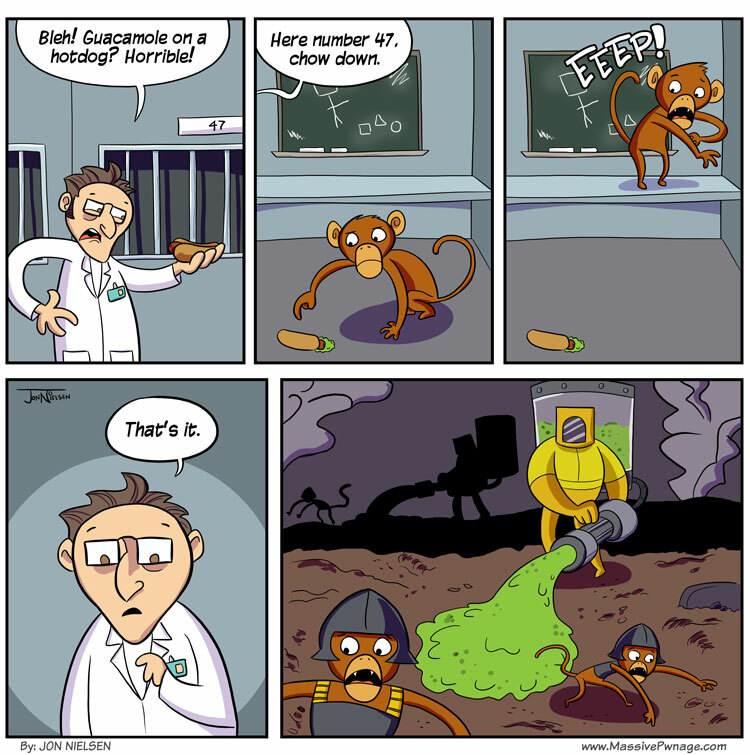 This entry was posted on Monday, January 30th, 2012 at 12:00 am and is filed under Comics. You can follow any responses to this entry through the RSS 2.0 feed. Both comments and pings are currently closed. Where are the flying monkeys with lightsabers? Those didn’t appear until the Great Simian Rebellion of 2486, when the Ape Overlords began their own research into ancient Simos Technology. Using their dexterous bodies, the monkey warriors trained until they became agile poop-throwing psionics. The Ape Overlords were pleased indeed, and armed their warriors with the latest reverse-engineered Simos weaponry. I found it funny that the monkey decided to stand in that exact location, his tail being precisely where the “x” should have gone, if the chalkboard diagram of the Playstation controller button layout were complete. Haha, you’re right. That’s pretty funny. Do you guys still have that Minecraft server and if so may i ask for the server address? Also the comic was good.